Racing at the WD-40 Phillip Island SuperSprint starts today, and when the lights go out, it will be every man for himself. The drivers have one last chance to practice today, with a 15 minute practice session at 11.10am kicking things off. Then, the Island will ignite as the drivers fight for ARMOR ALL Pole Position during today's two 10-minute qualifying hit-outs. Cars will file out for the first qualifying session at 12.45am, ahead of the second session at 1.10pm. Afterwards, get set for two intense battles on the fast and flowing circuit as the drivers fight to make every point count. The green flag will drop for the first race at 3.10pm, before the second 60 kilometre sprint at 4.55pm. But before the drivers head out to battle, wish them good luck during the official V8 Supercars Autograph Session. From 9.30am, each driver will appear out the front of their team garage for half an hour, signing autographs and taking photos with fans. The Aussie Racing Cars, Touring Car Masters, Sport GTs and the Formula 4 Championship will also burn some rubber around the fast and flowing circuit today, while the Showtime FMX crew and Hot Wheels Stunt Team will perform their thrilling shows on track too. Enjoy all of this on-track action from the comfort of your own car, with the Park and View ticketing option. 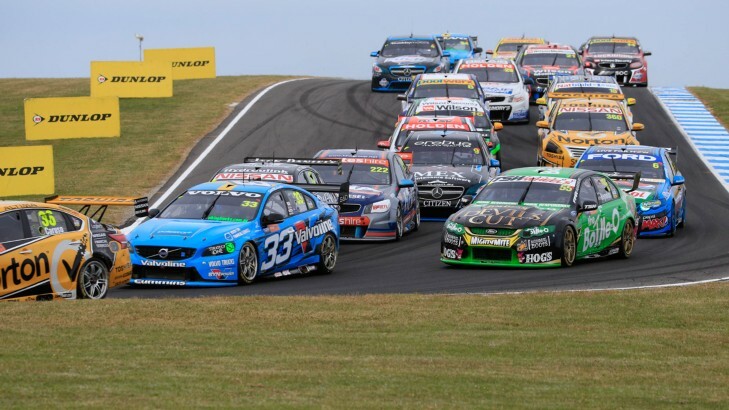 Park up between turns 1 and 2, and 7 and 9, and get an up close view as the V8 Supercar drivers navigate the speedy turns, with food and drink outlets and facilities close-by. Make sure you pre-purchase your Park and View tickets - passes to the best seat in the house sell out fast. Look to the sky to see Australia's Top Gun Joel Haski thrill crowds with his intense aerial display in the Red Bull Stunt Plane. You won't be able to look away as Joel hits speeds of over 400 km/hr above the Island, while throwing in a mix of Air Race World Championship stunts and stunning aerobatics for good measure. With kids 12 and under receiving free trackside admission with a paying adult, the WD-40 Phillip Island SuperSprint is the ultimate family outing. Between 10am and 4pm, the little race fans will be kept entertained at the Disney Zone with the brand new inflatable Disney/Pixar's Cars obstacle course that will have them bouncing off the walls and sliding down the slopes. The all new Cars Ice Racers ice rink will put their ice racing skills to the test, while they can catch up with Lightning McQueen and Mack the Transporter from Cars and chill out and watch a movie in the cinema. The Cars race track returns to the Island, as well as a bunch of craft activities and interactive iPad Zone for little gamers and puzzlers alike. Head on over to the northern end of the Island Pavilion to check it out. See the Island ignite at the WD-40 Phillip Island SuperSprint. Click here for ticketing options and event information.